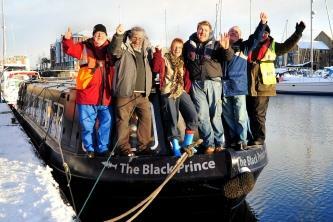 On Friday 17th December Swansea’s Community Boat sailed through the lock gates of Swansea Marina. It has cost thousands of pounds and taken years of planning. But the dream of a community boat for Swansea has at last become a reality. Former teachers John Davies and Charles White hatched a plan in 2004 to run a boat service which could act as a learning experience for children and adults along the waterways of Swansea. Read the full story and check back here soon for more information on the arrival of the boat. This entry was posted in Arrival and tagged arrival, newspaper on 20 December, 2010 by MAW.